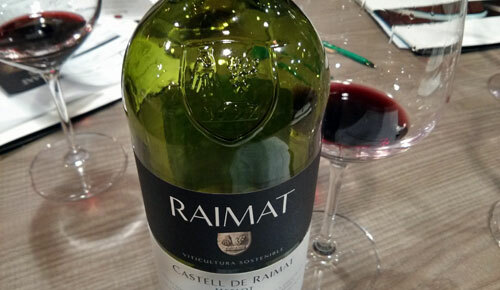 Sometime back, I joked that the Costers del Segre winery, Raimat was more reliable than god. The reasoning behind this is that they have a very nice price point for their wines and so you find them on countless menus throughout Catalonia. Despite the affordable prices, though, they’re always solid, reliable lines, thus the god comparison, which may be a bit over the top, but still then again, maybe not when you look at something like the platypus. Albariño 2012 shows off a perfect take on this grape. It’s overall neutral with petrol notes developing in to a bit of bitter melon in the nose. Nicely citric in the body, but not overpowering, it leaves a granitic aftertaste in the finish. Chardonnay 2012 starts out nice and bright in the nose with a hint of white fruit and a touch of tropicality. Banana elements come up in the nose that I didn’t care for and the body has a bit much of a sweet aspect for my tastes that drift in to pineapple and make it a bit cloying overall. But, I typically don’t like how Chardonnay is typically vinified, so this isn’t a shock. Xarel·lo 2012 gives off a bit of mango to the nose and other tropical elements along with white pepper. Bright in the mouth, the acids comes up nicely, but both the nose and the body stray far too much in to a dairy, Parmesan quality that put me off as I generally love Xarel·lo for its light, breeziness that dances in the mouth, but I didn’t find this aspect in this wine. Merlot 2010 was surprisingly full of dark fruits in the nose with a touch of vanilla from the barrel regimen. The body was well balanced with nice acidity, but didn’t have a lot of tannins or depth overall. Still quite pleasant for general drinking with a nice punch of character to it. Cabernet Sauvignon 2008 had aromas that smacked a bit much of being heavily extracted and gave way to tobacco elements. The body tosses out all kinds of dark fruits and while well built with a nice tannic structure, it pulls back just at the right moment to fill up the palate, but not overwhelm. It’s not a fancy Cab, but it’s most definitely satisfying. Syrah 2008 was similar to the Cabernet Sauvignon in the nose initially, but with a good hit of air, the refined elegance of its aging regimen came out. Roasted corn and root vegetables came out in the body along with a nice earthiness. The acidity was refined and wonderfully pleasing. Overall, it started out quite large in the glass, but with just a little decanting, it showed off a really, really great balance and a delicious bottle. A cabernet good in body and taste, satisfying … yet not overwhelming. Price point perfect for this inexpensive wine.